Hey Everyone - can I ask a favor? I promise it's easy. Remember this little outfit? 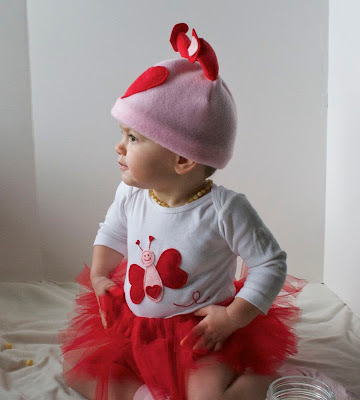 I entered the Valentine's Day Outfit Contest over at Whimsy Couture with my Little Love Bug Outfit a while back. I figured since my outfit was my own design, the odds wouldn't be too bad. The downside is the linky photo there looks SOOOO blurry and terrible, it just doesn't look like it does above. I know it's a long shot to win, but if you liked it and could take a moment to head over & vote for it, it would make my day. Just click HERE to see the contest & vote for my Little Love Bug (#12). P.S. I have a special giveaway treat for you at Monday's Craftastic Link Party, so think of it as good karma for the giveaway if you vote;). Thanks so much & have a great weekend!! Voted for you - good luck! Done! So many cute outfits there!